It is also one of the only games where you are able to take control and ride the Johto beasts as well as the Hoenn dragon duo Latios and Latias. There sadly isn't much in the way of merchandise for this game as it was just a spin-off but I have managed to get a few things. 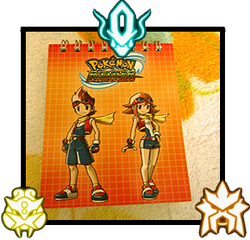 The main player characters Ben (Natsuya) and Summer (Minami) are on the front while Ukelele Pichu is featured on the back as well as the pages inside. 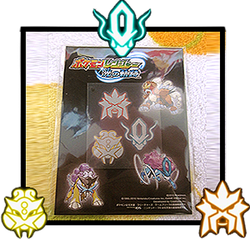 One of two promo gift you could get if you preordered the game at Pokemon Centers throughout Japan. 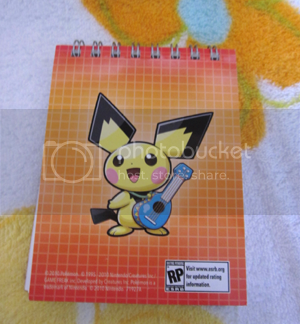 It has Guardian Sign's game cover on the front and stock are of Ukulele Pichu over a map of the Oblivia region. 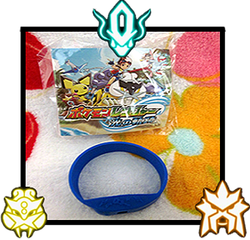 The second of two promo gift you would recieve from the Pokemon Centers in Japan for preordering the game. This is a small blue rubber watch with etching of Ukuele Pichu on the band as well as palm trees and ukulele's. The Seals/Stickers were promo items when the game was preorders at Itoyokado. They are the same in game designs as when the Beasts are called. The are extremely tiny stickers but very sparkly. I was lucky enough to have a friend that kindly offered me her promotional gift when the game was picked up in game stores in Italy. This is a cute little keychain using Ukuele Pichu's stock art. This item I am guessing of it's origin as there is a stamp of a Japanese magazine on it on the clear green ruler. The ruler as well as a pencil for the Heart Gold and Soul Silver games were inside the metal case. Another item I am unsure of the origin with this ruler/puzzle. The only idea I have to go on is that it came with a small guide book. These figures are custom "Pinky St." figures. Made primarily with Fimo soft polymer clay and acrylics paints. (Which need repainted one more. ^^;) The both took about 5 hours spanning two days (Paint drying) to complete. 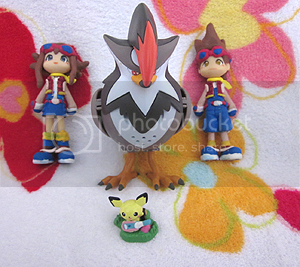 With their (Jakks) Staraptor and (Footprint Figure) Ukuele Pichu . 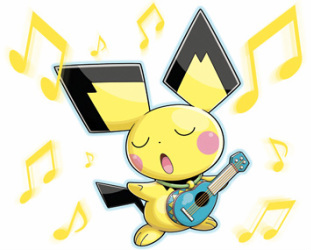 I was disappointed that with the abundance of Pichu in 2010, that Ukulele Pichu would be granted a plush, even a small one. But sadly no... So I figured I'd design one myself. The plush is a Spring 2010 UFO catcher and the ukulele is custom made with still felt, string and acrylics paints. I've so far used her with my Ranger cosplay. She's just about the right size as she was in the anime special. Bell Plush are small plush that come with tiny bell and a string. They are very popluar and alot of custom artists are very good at them. The Ukulele Pichu Bell plush is actually my second BP custom from this artist. I love her work. Uku is very tiny and have a small gold bell with a white string.